Marlisa Small welcomes all the people who enter Marlisa’s Wig Studio & Spa in Little River, SC as if they are her best friends. She has a love for humanity because she’s been close to death and knows how precious life is. She has raised $500,000 since 2010 when she started her ministry “Wigs for Cancer,” a 501(c)3 nonprofit organization. Anyone who comes to her studio and needs a wig due to loss of hair because of cancer treatment gets a brand new wig free of charge without any strings attached. 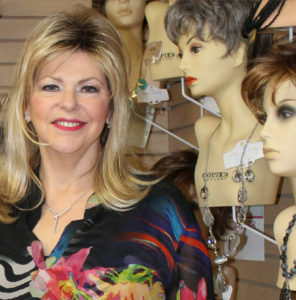 “I had the inspiration to give free wigs,” she says and cites her Christian devotion. She has given away more than 6,000 wigs. In 1991 Marlisa was in the jewelry business in Greensboro, NC when she was diagnosed with stage four cervical cancer. She had a radical hysterectomy and declined chemotherapy, radiation treatments and supplemental hormones because she believed she was going to die so no treatment would help her. “Singing is therapy for me,” she says. Marlisa recovered but lost her profession because she no longer was able to stand for hours. Instead she received her license as a nail technician. She also lost all her hair through stress and understood how uplifting it is to a woman’s attitude to wear a wig that makes her look like herself. Marlisa decided to buy a dozen wigs and sell them as a side service at the nail salon. The wigs sold quickly, so she bought two dozen more. The venture proved successful, but she outgrew her space at the salon and had to move. In 1996 she came to live along the Grand Strand in South Carolina and opened her own nail and wig salon. In 2016 she moved to a bigger shop in Little River and opened her day spa. Marlisa began holding fundraisers in order to distribute as many wigs as possible and attracts donors because she is a talented singer and often performs at these events. She is avid about raising money for Camp Kemo, a summer camp for children 5-18 who have cancer. Because of her dedication to assisting those affected by cancer, she has earned awards for her generosity, philanthropy and humanitarianism. Further, she was nominated for and won the Ms. South Carolina Senior America 2018 pageant. At the national contest, she was selected as one of the top ten winners. She has fundraisers scheduled well into 2019 including the 8th annual Wigs for Cancer Gala Feb. 22. She accepts hair and wig donations, which go to those with cancer. She married David Small six years ago, and between them they have six children and 13 grandchildren.